The remotely accessible cameras and door locks to a good job of protecting the Sarasota residence; the Crestron system provides the homeowners with means of controlling the home environment. From a Crestron mobile app, the owners can prep the house as they leave the airport, adjusting the Crestron thermostat and opening the Lutron HomeWorks QS window shades, for example. 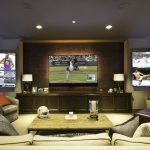 They might also turn on a few lights, courtesy of the Lutron HomeWorks QS system, and instruct an Autonomic Mirage media server to stream music to the Paradigm speakers and Leon Speakers soundbar in the family room. As the pull into the driveway, the house is bright, welcoming, and comfortable for their arrival. In the same easy manner they can prepare the house for their departure, using their smartphone to sweep through the house to close the shades, adjust the thermostat, turn off the lights, activate the security system, and lock the doors as they drive away. As convenient as the mobile app is to prep the house for their arrival and departure, it comes in just as handy for simplifying common, everyday routines. The three in-wall Crestron touchpanels serve as home control dashboards, showing the homeowners the status of every light, shade, surveillance camera, door lock, security sensor, thermostat, and Pentair swimming pool controls on the premises and enabling them to adjust the settings of anything from any of these convenient locations. 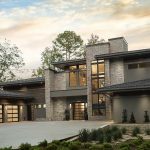 In addition to facilitating simple, easy management of the home environment, the Crestron system also delivers music and video to several destinations in and around the house. 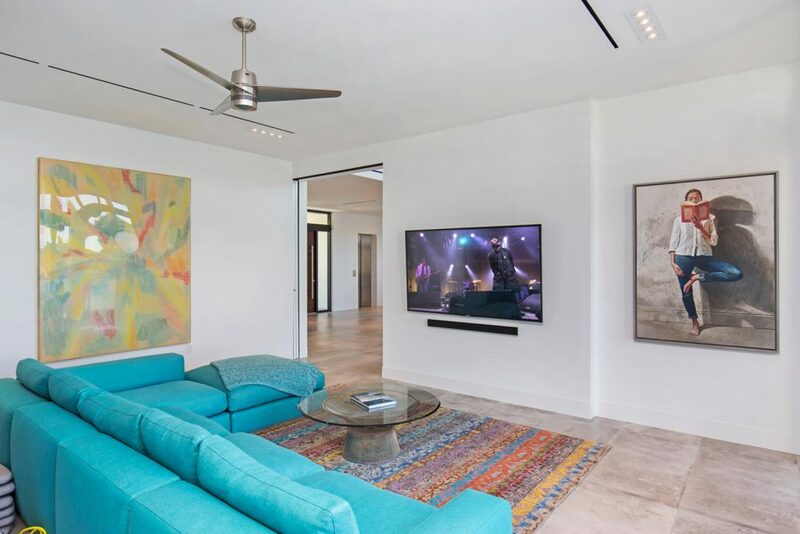 Using a Crestron remote, the owners can cue video from their video distribution system to play on any or all of four Sony TVs. Audio from the Autonomic Mirage Music system, meanwhile, can be dispatched to nine different music listening zones, including a pair of Terra speakers poolside, and a surround-sound system in the family room, where an Anthem receiver, Paradigm speakers and subwoofer, and 75-inch TV do the entertainment honors. 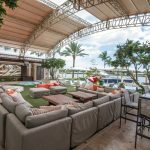 No matter the season, no matter the day or if they’re five minutes or 5,000 miles away, the homeowners of this Sarasota home are in complete charge of their waterfront destination. 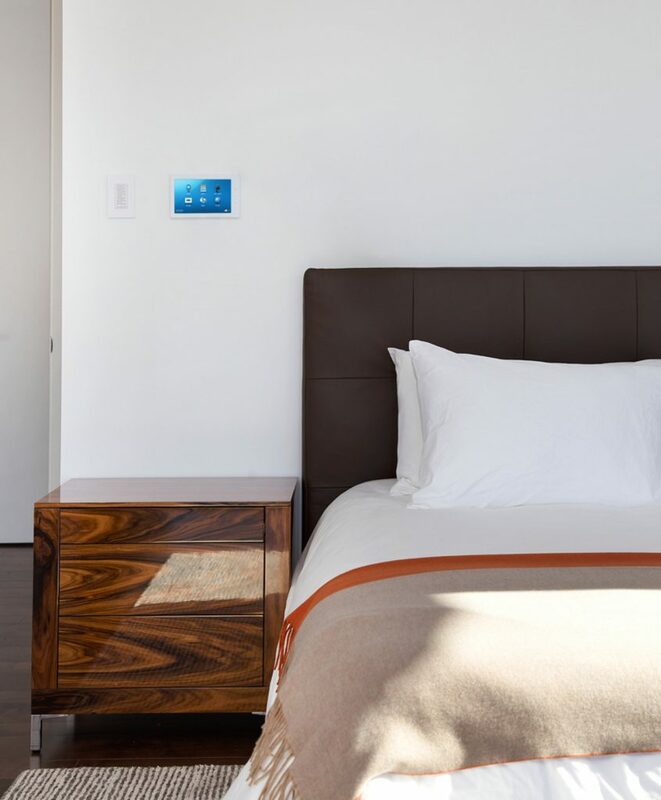 They can use a mobile app while on the road or a sleek Creston wall-mounted touchpanel when they’re relaxing at home to alter the environment to their liking. 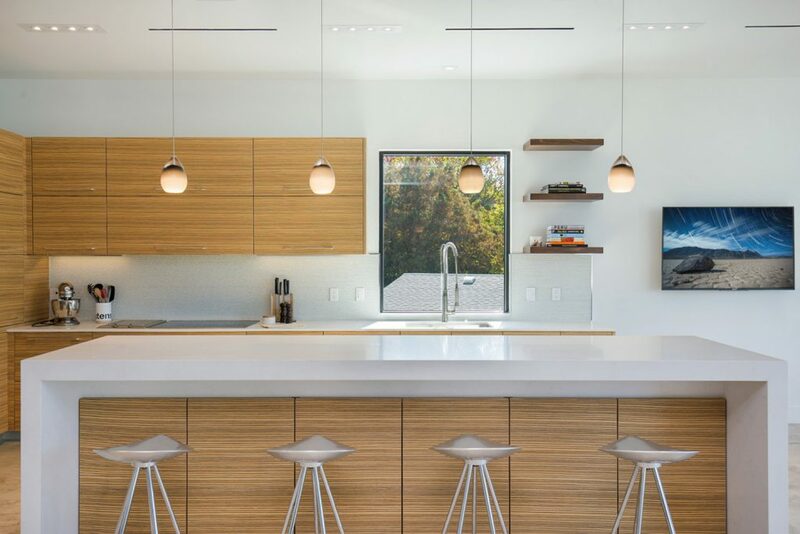 And when it’s time to leave the residence, the Crestron system, in coordination with top-notch security devices, ensures that the house is safe and sound until their next visit. Want your shades lowered? Do it in seconds from a smartphone. Not sure if you locked the door when you left the house or left the garage door open? Again, it’s as easy as pressing a button on your smartphone. 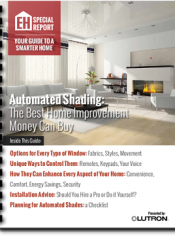 Our FREE comprehensive Smart Home Planning Guide helps you plan what features best suit your needs. Get Your FREE Planning Guide Today!